Here we document the history of The Logger’s Retreat vacation home, before, during and after the Railroad Fire of 2017. 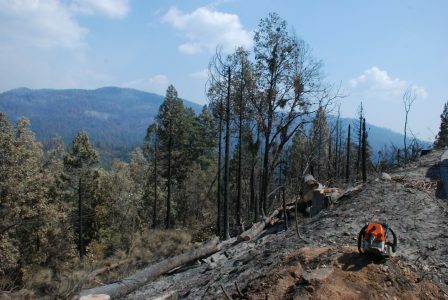 Shortly after noon on August 29, 2017, a wildfire started nearby and below the property in tinder-dry national forest land. As in much of California, the surrounding forest was filled with dead and dying trees, victims of years of drought and bark beetle infestation. Winds quickly pushed the flames up slope and north toward the small town of Fish Camp. 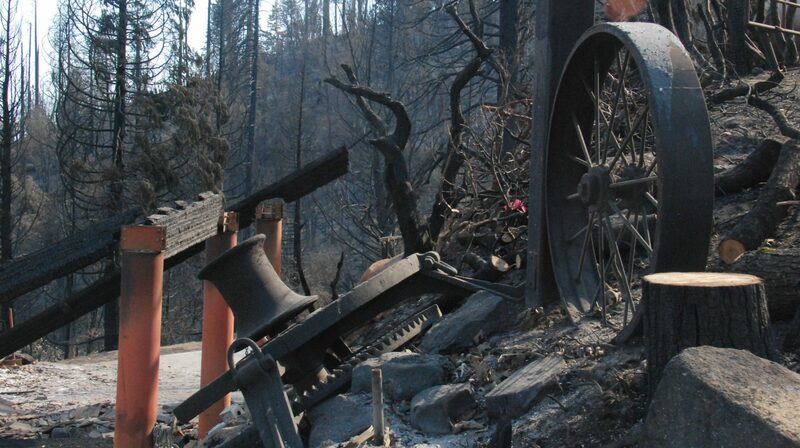 Within minutes the Logger’s Retreat became likely the very first of 17 structures lost in that fire. Two neighboring houses on properties immediately adjacent to the Logger’s Retreat surely would have been lost too, were it not for the efforts of our neighbors and dedicated first responders. Despite this tragic loss of our home we are grateful to them for their skills and hard work; efforts that certainly saved many more homes in the area from a similar fate. 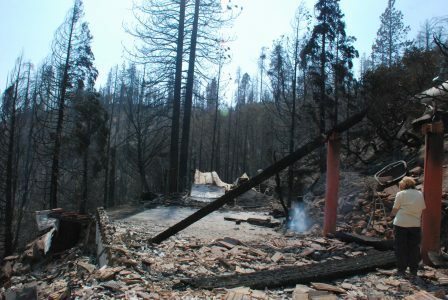 As part of our recovery from the fire, we do plan to rebuild the Logger’s Retreat. In these pages you can follow our progress on that plan. While we rebuild, we know the surrounding forest will be recovering too, and we look forward to seeing that process unfold before us as well. If you are curious about how the Logger’s Retreat was built, please feel free to browse through selected images from the original owner’s photo album. Or for more recent history, you can also browse through some of our own photos of this unique and beautiful property. 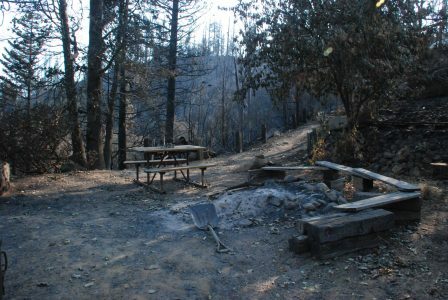 If you have a memory or a brief story about a connection you had to the Logger’s Retreat before the Railroad Fire destroyed it, we invite you to share it in the Comments section below. Photo above: Fire burns near road work on Highway 41. This road work was the tree cutting work that was initially reported as the cause of the fire. 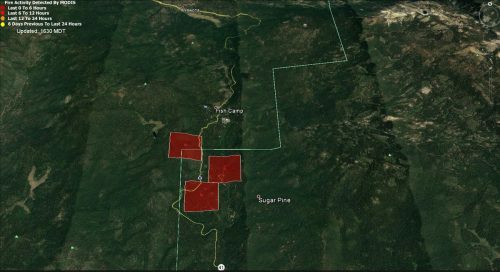 This is a Google Map published by Sierra News Online in the initial hours of the fire, showing where it started according to initial dispatch reports. Note the close proximity to the Logger’s Retreat. My cell phone logs tell me the call from our caretaker came in at 12:57pm on August 29, 2017. With an urgency in her voice she said she had seen a smoke column south of Fish Camp “really close!” to our property. 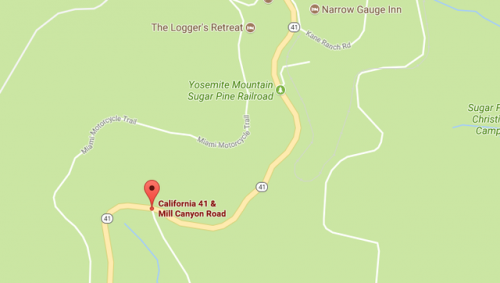 The location of the fire was given as “near Highway 41 and Mill Canyon Road,” not a quarter mile from two houses we own on a steep hillside above and across the road from the Yosemite Mountain Sugar Pine Railroad. 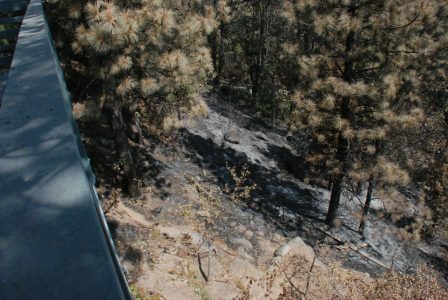 …As of 12:53 p.m., the fire was reported about 50 feet from the roadway near the Sugar Pine Railroad. 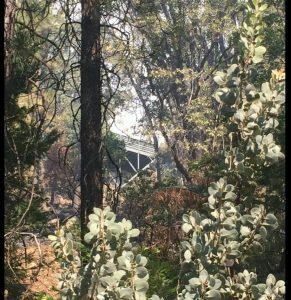 This early image from the Madera County Sheriff’s Office shows a ground fire in the trees, across the road from the Railroad and directly below the Logger’s Retreat. One thing was certain: it was clearly advancing northward very fast. …At 12:58 p.m. Air Attack was overhead and reported the fire at 30-40 acres, moving east, with a potential for a few thousand acres. 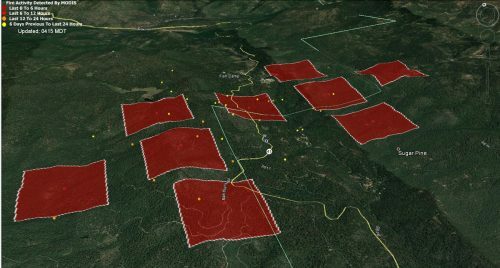 The Railroad Fire would take two and a half weeks to contain, cover 12,407 acres of forested land, and require the efforts of hundreds, if not thousands of firefighters to control. 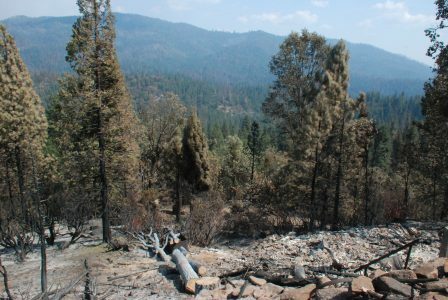 Sierra National Forest officials finally declared 100% containment on September 16, 2017. In retrospect, the Logger’s Retreat was probably lost within the first hour of the fire. But we had no way of knowing that at the time. During the initial days of the fire perhaps the worst part for us was the uncertainty; the anxiety of having too many questions and no answers. Each bit of reliable information we did receive led to more unanswered questions. Early on, we did have a few facts to work with. 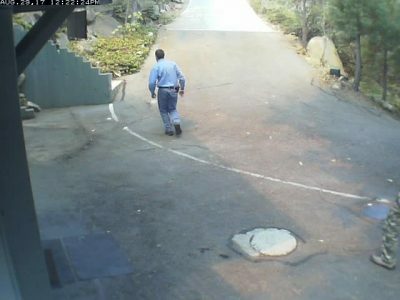 The most direct were from several webcams we maintain at the properties. They recorded the selfless efforts of neighbors and first responders rushing in to save lives and property. At 12:22 pm a neighbor from the YMSPRR arrives at the Trestlewood Chalet to warn any occupants of the fire. Luckily both properties happened to be empty at the time. Note the orange tint to the sunlight on driveway. 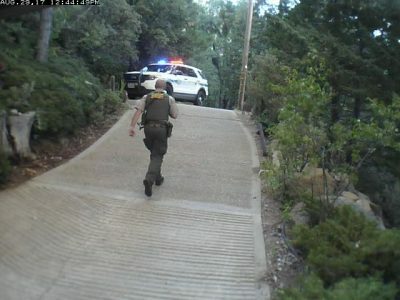 Twenty minutes after our neighbors at the Yosemite Mountain Sugar Pine Railroad checked for occupants at the Trestlewood Chalet, the Madera County Sheriff drove up to the Logger’s Retreat to evacuate any occupants. 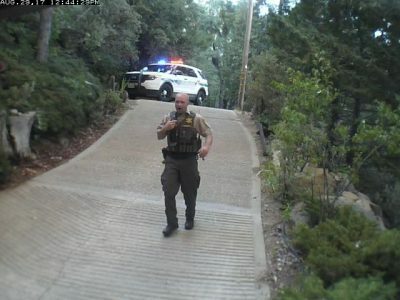 At 12:44 pm, Watch Commander Jacob Tallmon of the Madera County Sheriff’s Office arrives at the Logger’s Retreat to evacuate any occupants (it too was unoccupied). I spoke with Officer Tallmon several days after the photo above was taken. First and foremost I wanted to thank him for his dedication and his service. This is an example of Madera County’s Finest, at their finest. I was also curious to hear an eye witness account. Officer Tallmon was one of the very first of the the first responders on the scene of the fire. 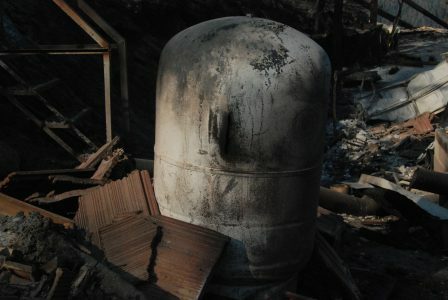 He told me that at the time he arrived the fire had not yet reached the house, but there were already spot fires burning on the property — for instance near the propane tank. He knew he would have very limited time to evacuate anyone there. He also knew then that the house would be lost. Fortunately he was able to quickly confirm that the house was empty and leave within about 30 seconds. As he predicted, the Logger’s Retreat was of course lost. 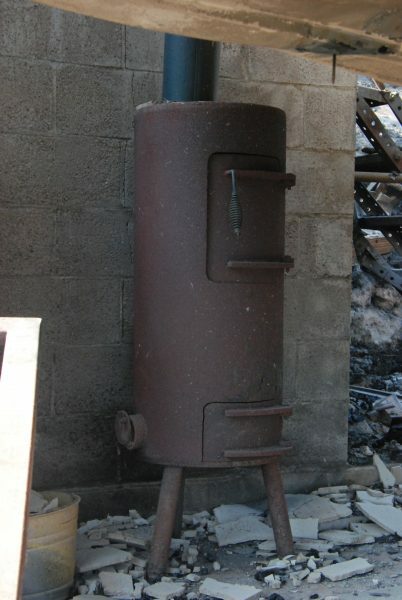 But we found out afterward that the propane tank was left virtually untouched by the fire! 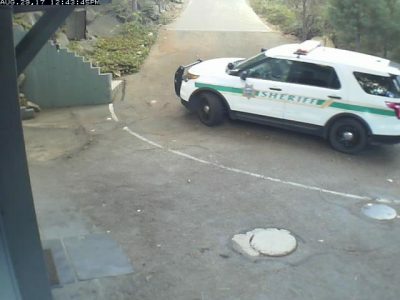 If you would like to hear the Madera County Sheriff’s Office in action saving lives and property, below is the public recording of their dispatch audio from 12:40 pm to 1:10 pm. 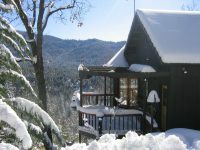 Only minutes after Officer Tallmon left the Logger’s Retreat, Caltrans arrived at the Trestlewood Chalet with a water tank truck. They were able to put down some water around the base of the house. Within a few minutes they packed up and left, as the situation became too dangerous for them to do anything more. By shear coincidence several weeks later we happened to meet the Caltrans worker in this photo. He told us that at the time they left, they thought this house would be lost too. And while the flames came within three feet of the house, in the end it was spared with no damage to the structure itself. We are convinced that were it not for the efforts of these heroic Caltrans workers, the Trestlewood Chalet would have burned down as well. Words cannot adequately express our gratitude to them. 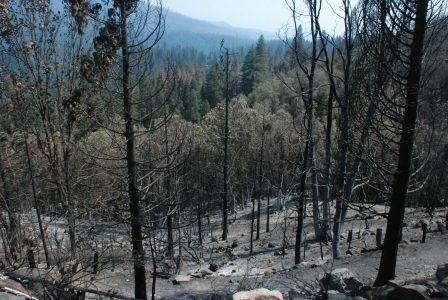 It may be hard to grasp how fast this fire actually spread through the national forest, fueled by dry conditions, thousands of trees killed by drought and insects, and winds that quickly pushed the fire up slope and up canyon towards Fish Camp. 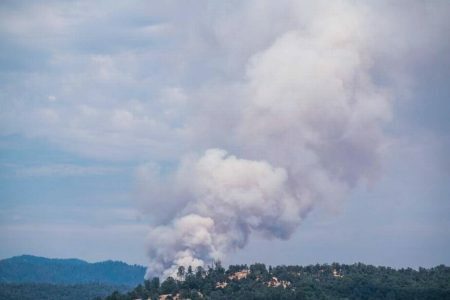 Gina Clugston’s first post at 12:30 pm on August 29, 2017 at Sierra News Online reported the size at “30-40 acres.” By 2:45 pm she reported the size to be estimated at 300 acres. By 5:28 pm the estimate was 1000 acres. On the next morning (August 30), at 7:27 am she reported a revised estimate of 920 acres and 5% containment. By 8 pm that evening the estimate was back up to 1200 acres with spot fires spreading the fire eastward. This is the MODIS satellite overlay for August 30, 2017, showing how quickly the fire moved northward. Lighter colors are older hotspots. The Trestlewood Chalet and the Yosemite Mountain Sugar Pine Railroad are located in that tiny area of green bounded by yellow and red squares. Fish Camp is at the top of the image. On the morning of August 31, the fire was described as “very active” overnight with a new estimate of 1901 acres. By 9 pm that night the estimate was up to 2185 acres and containment was down to “zero percent.” Firefighters were challenged by triple-digit temperatures and thick smoke which made air support difficult. 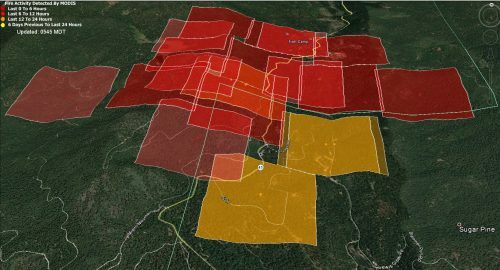 This is the MODIS satellite overlay for August 31, 2017, showing how the fire was prevented from entering Fish Camp and had now spread out to the east and west into steep and rugged national forest terrain. Over the next week the fire would push east deep into the national forest, over the ridge into the Nelder Grove of Giant Sequoias. Thunderstorms brought some helpful moisture but also erratic winds which sent the fire back towards the south, past Sugar Pine and down to Cedar Valley and Sierra Sky Ranch. 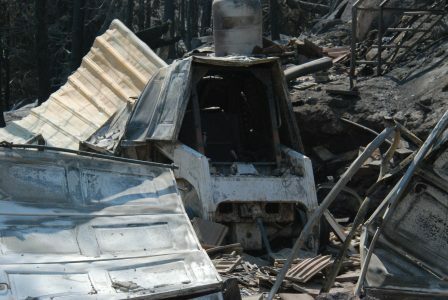 Although the fire immediately around the Logger’s Retreat had long since passed through, the fires to the south kept Highway 41 closed and kept us in the dark as to the condition of our properties. 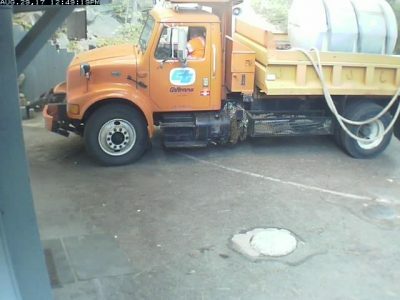 Even after those threats were managed, Caltrans kept the road closed so they could remove literally hundreds of weakened trees that threatened public safety. We heard a few reports from first responders in Fish Camp that the Logger’s Retreat was probably lost, and finally on September 3rd, we received photographic confirmation. While this was of course bad news, at least it was a small piece of Certainty, something that up until this point had been quite hard to find. Yet the fate of the Trestlewood Chalet still remained uncertain. We had seen a photo of the structure through the trees, confirming that it was at least still standing. 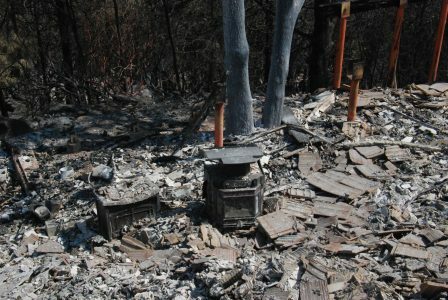 This is the only photo we had showing the Trestlewood Chalet still standing. It was provided to us by reporter Joe Moeller on the scene who snapped it in response to an opportunistic request from our son via Facebook :-). Thanks Joe! Despite this bit of ground truth, the condition of the unseen parts of the house and its contents still remained completely unknown to us. It wasn’t until Saturday, September 9, a full twelve days after the start of the fire, that we were finally allowed onto our property again. 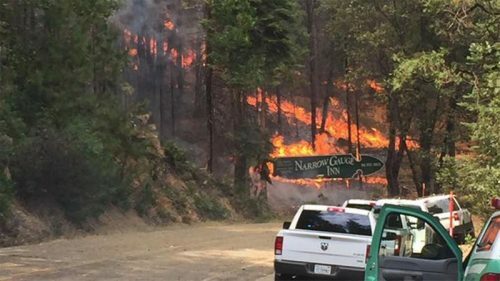 We were told that property owners would be allowed back into Sugar Pine by 3pm Saturday afternoon, and that Highway 41 would be reopened by 5pm. We arrived in Oakhurst around noon and the officers on duty at the Sheriff’s station were able to allow us to drive up shortly after noon. It is frankly a bit strange to drive up Highway 41 and not encounter any cars along the way. The drive was almost pleasant in that respect. 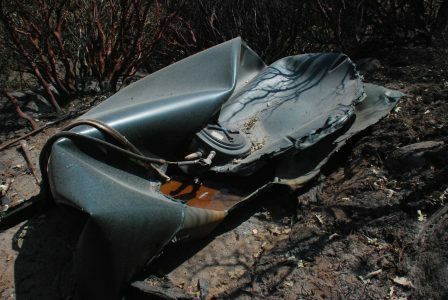 The air smelled of campfire – everywhere – but visible signs of the fire along the road itself were only apparent as we approached the Westfall fire station and Mill Canyon Road. There the transition was stark. The forest floor was black and gray everywhere. 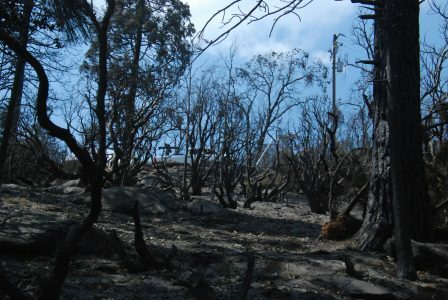 In some areas the fire had reached up into the canopy, leaving only the blackened skeletons of trees. 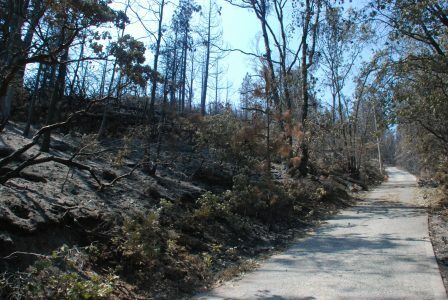 In others the trees retained their foliage, though all had been browned from the heat of the ground fires below. Somewhat oddly, the forested area nearest to our driveway was still green. 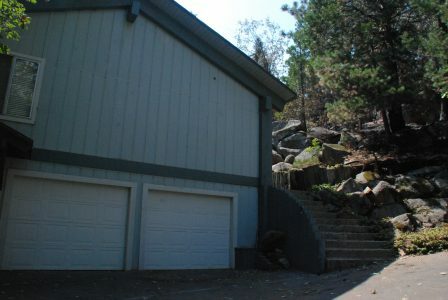 Our neighbor’s garage on Highway 41 looked completely normal. 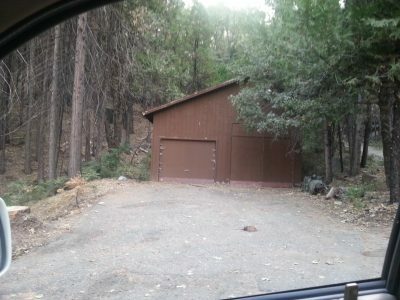 The trees around our neighbor’s garage are still green, the forest floor untouched by fire. Even the lower half of the driveway itself looked deceptively normal. Looking down the driveway towards our neighbor’s house. 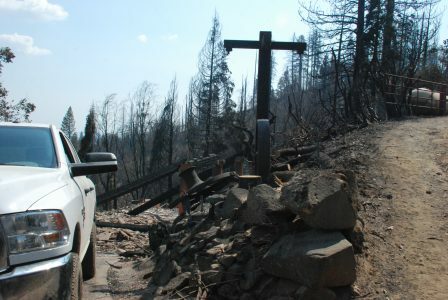 The only things seemingly out of place are the fire hose laid out along the right side of the road, and the fact that the cord of firewood that was stacked near the tree on the right is just…gone. To our great relief, the Trestlewood Chalet looked normal too. Yet the normality was indeed deceptive. It masked the intense drama and real danger that had flashed through, so close by. Just below the house the front yard was blackened and the trees brown. Above the house, the fire came within three feet of the roof and front door. The hillside above the Trestlewood Chalet was anything but normal. 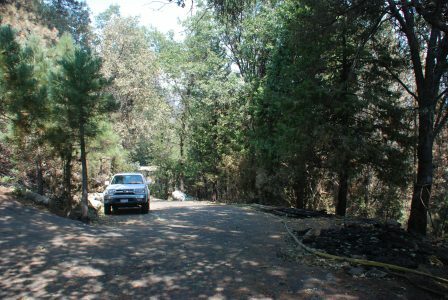 Before the fire, the forest here next to the driveway had been dense enough so that no sky was visible through it. What had been dense forest was now blackened, open land. The trees were stripped of all vegetation from bottom to top. 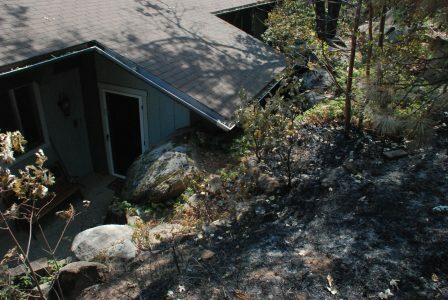 It was clear the ground fire had transitioned to a crown fire only yards above the Trestlewood Chalet. 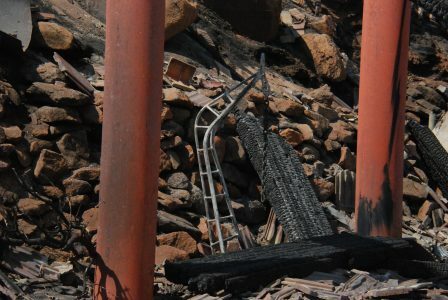 In this view up slope, through burned manzanita you can now see the power pole and the crossed beams of the light fixture at the entrance to the Logger’s Retreat. 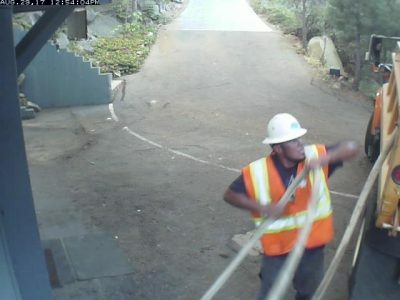 Pacific Gas and Electric had a crew on our property taking down any trees that might threaten their power lines. 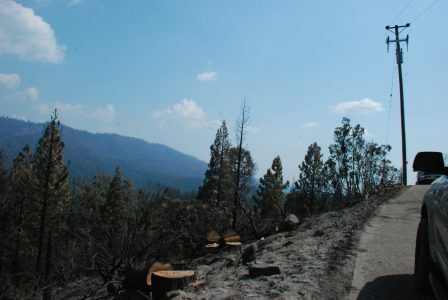 Many, if not most of the trees that had been left standing after the fire were now downed, or coming down by chainsaw. In this view to the southeast you can see where the ground fire transitioned to a crown fire. What was once a forested hillside thick with pines, oaks, manzanita and bear clover is now a barren open space, stripped of all vegetation. It is odd to come to such a familiar place and see so many familiar things, now in an entirely different context. 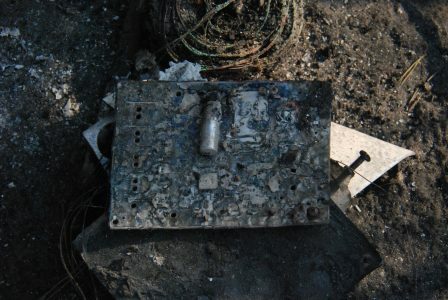 As we explored the wreckage, the incredible intensity of this fire was readily apparent. 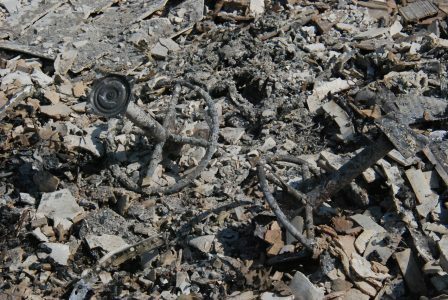 Melted metal and glass are mixed in throughout the rubble of broken tiles and concrete shingles. The sad steel hulk of our Bobcat skidsteer is surrounded by the ruins of the garage that housed it. On the ground behind the Bobcat lies a solidified puddle of lead — all that remains of its battery. These are the pedestals of the unique tractor-seat bar stools that surrounded the kitchen counter in our dining area. The tractor seats themselves are nowhere to be found — most likely melted away in the heat. 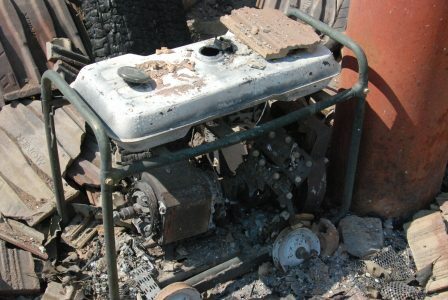 Despite the obvious intensity of this fire, a few things actually survived nearly unscathed. Our picnic table and the railroad-tie benches around the fire pit look as though nothing has happened. The Railroad Fire is now history. The damage is done. Regardless of whether we like the prospect or not, all we can do now is move forward. We will rebuild The Logger’s Retreat, and it will be beautiful once more. But we know it will never be the same again. We will never be the same again. 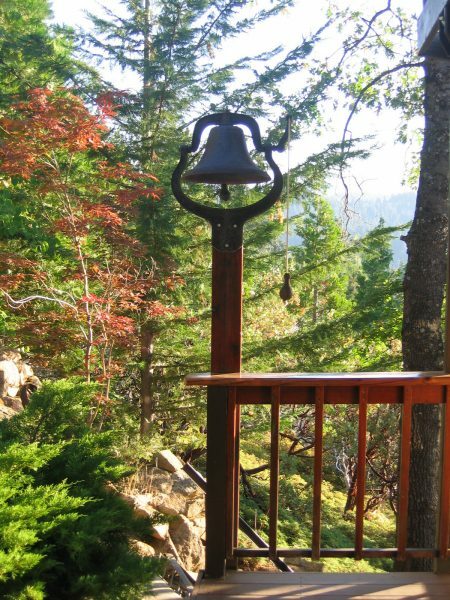 We recovered this bell from the fire’s ashes, and we hope to hear it ring again — soon! 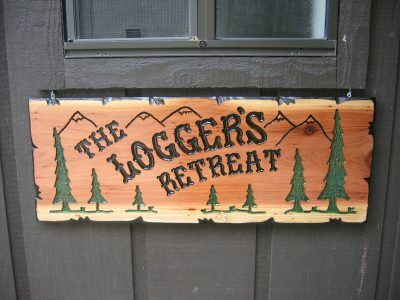 We will document the process of rebuilding the Logger’s Retreat as a “blog” in the After The Fire portion of this website. If you are interested, please join us there for the journey. 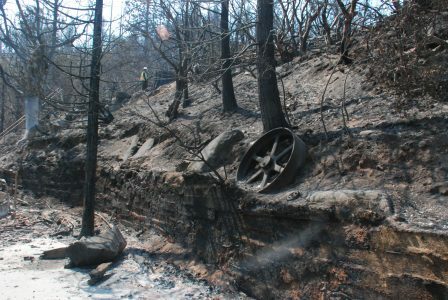 If you have a memory or a brief story about a connection you had with the Railroad Fire itself, we invite you to share it in the Comments section below.